Originally released as Operation Flashpoint: Cold War Crisis. Many bugs in the game may be game-breaking. It's highly recommended to use the latest version of the game. 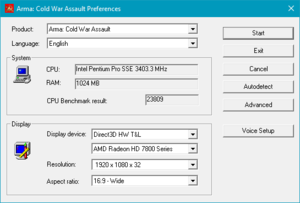 Free upgrade from Operation Flashpoint: Cold War Crisis to ARMA: Cold War Assault. Not optimized to run on modern hardware. Highest video settings will cut your game performance. GameSpy online server browser has been shut down. Use Master Server Browser. SafeDisc DRM[Note 1]. Removed in later patches. 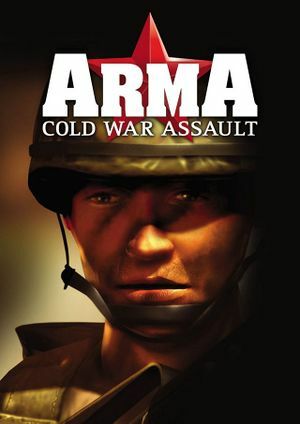 ARMA: Cold War Assault doesn't include the Red Hammer expansion, which was developed by Codemasters. A universal patch that upgrades any retail version of Operation Flashpoint to ARMA: Cold War Assault can be downloaded here. If you have a retail copy of Red Hammer campaign, you can add it back to ARMA: Cold War Assault. Either open a folder where Red Hammer expansion is installed or go to a root folder of a CD with expansion pack. There go to a folder AddOns and copy a file VoiceRH.pbo to a folder AddOns in ARMA: Cold War Assault folder. Go to a folder Campaigns either in a folder where you have installed Red Hammer expansion or on your CD. Copy a file redhammer.pbo to Campaigns in ARMA: Cold War Assault folder. A retail copy of expansion is required for this; Red Hammer expansion is not available digitally. Enabled by default. Can be forced off in the graphics card control panel. External advanced video settings (Performance). External advanced video settings (Effects). External advanced video settings (Textures). External advanced video settings (Details). The game detects widescreen resolutions but stretches everything from 4:3 by default. Modify any options and quit the game. Select the game and configuration file. Adjust the FOV slider or tick the "Auto" option. Save changes and launch the game. Using -window argument causes major issues with the mouse cursor. Axis can be natively used only in aircraft. 12 In-game server browser doesn't work. Use Master Server Browser. Never use "Very high" terrain quality setting, nor exceed 1200-1300 visibility.